Description: The red-tailed hawk is a large bird with broad, rounded wings and a short, wide tail. They vary in colour between the subspecies, but are typically brown with lighter undersides and a streaked belly. However, they all have the distinctive rust-red tail feathers. They are 45-65 cm (1.5-2 ft) tall with a 1.1-1.3 m (3.6-4.3 ft) wingspan and can weigh up to 1.5 kg (3.3 lbs). The females are slightly bigger than the males. 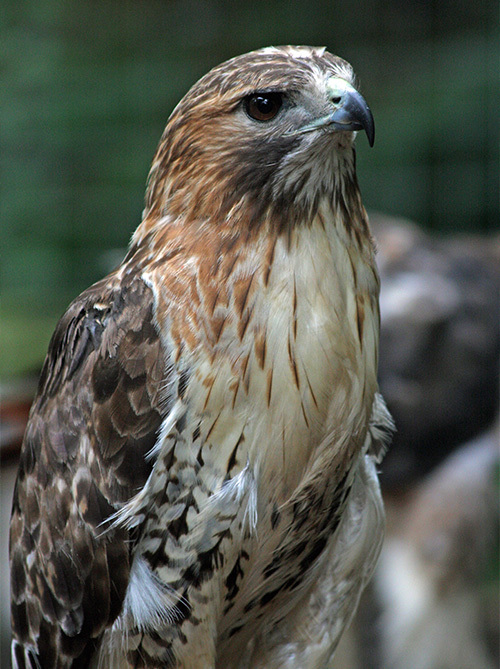 Distribution and Habitat: Common throughout North America, red-tailed hawks prefer open areas such as woodlands, fields, deserts and even parks. These open areas suit their hunting style of soaring in wide circles, or perching on trees and telephone poles, at the edge of clearings. 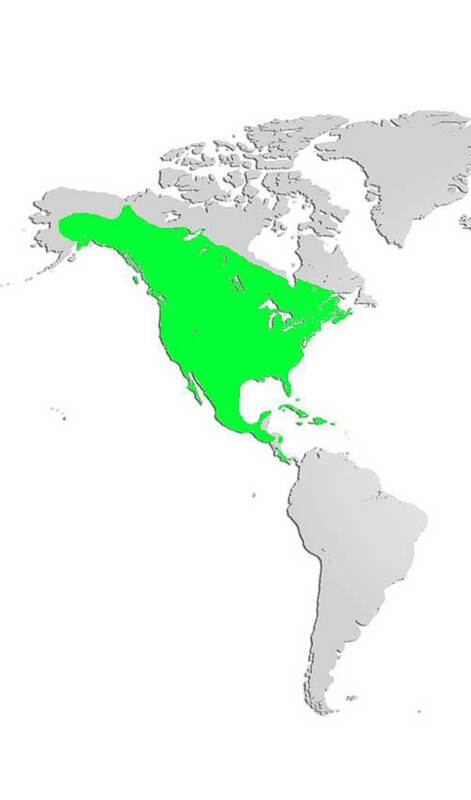 They range from Canada down into Central America and the Caribbean. Diet: Carnivores, red-tailed hawks hunt mostly small rodents like mice, voles and squirrels. They will also eat small birds, snakes, lizards, frogs and carrion. They are also capable of catching larger game like grouse, pheasants, jackrabbits and snowshoe hare. Life Cycle: Nests are located well above ground often in stands of hardwood trees and will be used year after year by the same pair of birds who mate for life. Pairs will build the nest together using large sticks and line it with smaller, finer vegetation and fix it up each year to use again. Females lay a clutch of 2-4 eggs and the pair take turns incubating the eggs for 28-35 days when they hatch in May. Young are born helpless and both adults feed them for 42-46 days before the young are ready to leave the nest. Did you know? Red-tailed hawks make a raspy scream that sounds like “kee-eee-arrr”. This shrill cry is used most often in Hollywood movies for any bird-of-prey including eagles, falcons and vultures.